LOS ANGELES (AP) – The big day is here. Anticipation for the Academy Awards has been building all week, and finally, it's time. The entire Hollywood & Highland complex is closed. Traffic is shut down on Hollywood Boulevard. Tourists can only get as close to the action as barricades and security will let them. The stars are ready for their red-carpet arrivals, and the theater is ready to host the movie industry's biggest night. BLOGGERS: Just in case there isn't enough Internet buzz about the Oscar red carpet, the motion picture academy and sponsor Kodak invited a few bloggers to tweet from the fan bleachers this year. Marsha Takeda-Morrison, who blogs about parenting in Los Angeles at SweatPantsMom.com, posted a link to a photo of herself on Twitter. "Me on (OK — near) the Red Carpet!" she tweeted. "I think the companies are starting to see the power of social media and word of mouth," Takeda-Morrison said as she took her seat. I'll tell my husband it's for you." Mills was rooting for "Up" or "Avatar" to win on behalf of her 13-year-old daughter. She said she wants Jeff Bridges to win best actor, because "he's always good and he's been overlooked for so many years." Bloggers on the carpet "adds a more personal touch," she said. STEP BACK FROM THE CARPET! : Security has gotten tighter every year since the Academy Awards moved to the Kodak Theatre in Hollywood, according to residents of the area. Onlookers on Sunday could only gaze at the end of the red carpet from across the street and behind a chainlink fence that confined them to the sidewalk. "I have no idea what they're looking at, because it's just an empty carpet now," said 20-year Hollywood resident Alex Constantine, who was drinking his morning coffee outside a Starbuck's on Hollywood Boulevard. "I don't mind the commotion but security seems to be clamping down more every year." People were lining up a block away, waiting for police officers to let them approach the corner of Hollywood Boulevard and Highland Avenue and snap photos of the red carpet. "The security is excessive, completely exaggerated," said Alfonso Puicercus, a hotel manager from Barcelona, Spain, who wanted to see the red carpet for himself. "They treat these stars like gods who can't mix with the rest of us. But they're not." The motion picture academy does not comment on security issues, but Oscar veterans suggest the increased restrictions have more to do with worldwide terrorism than star treatment. 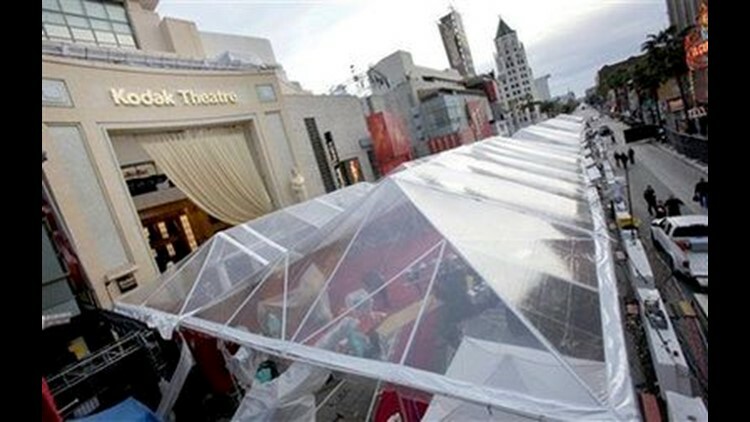 GREENHOUSE EFFECT: Workers erected a clear plastic tarp above the Oscar red carpet to keep the rain off during Saturday's overnight storm. But it was still up on Sunday morning, and even though it was only 65 degrees outside at noon, the Southern California sunshine created a greenhouse effect on the carpet underneath. It was even worse in the fan bleachers, where the sun beat down through the tarp and cooked the eager folks awaiting the parade of stars. People who came with sweaters and jackets and ready for a drizzle, stripped down to T-shirts and tanktops, fanning themselves with magazines. Others took refuge in the shade behind the bleachers. Squinting fans slathered on sunscreen they found in the motion picture academy's gift bag and waited for the sun to set behind the building and for the stars to come out. GOVERNORS BALL, TAKE ONE: Reporters, vendors and other non-famous folks had a chance to party like movie stars Saturday at the Governors Ball preview. Guests got a glimpse at the art-deco, supper-club setting inside Hollywood & Highland's grand ballroom. They sampled the paella, sushi and tiny crab cakes that A-listers will eat Sunday after the Academy Awards. And they heard from Oscar's official after-party organizers, Jeffrey Kurland and Cheryl Cecchetto. "I find this incredibly awesome," Kurland said, admiring the glamorous setting. On Sunday, hundreds of waiters and the 18 members of the ball's all-girl band will wear costumes Kurland designed. "This is the first time we are extending the look and feel of the ball to the actual staff," he said, adding, "there will be 18 women in the orchestra dressed in the same gown." He also called attention to the ball's new engraving station, where Oscar winners can have their trophies personalized instantly on site (winners used to have to send their trophies to the film academy's headquarters in Beverly Hills to have their engraved nameplates attached). Cecchetto, who has designed Oscar's after-party for 23 years, boasted about its fiber-optic crystal chandeliers and recessed lighting. "We're very proud of this year," she said. "And we'll make it even better next year." MIXED COMPANY: Monks mingled next to former General Motors employees at one especially electric Oscar soiree. HBO honored the subjects and filmmakers from Oscar-nominated documentary films at a posh Saturday evening party in the Veranda Room at the Peninsula Hotel in Beverly Hills. Attendees included "Super Size Me" filmmaker Morgan Spurlock and Paul "Popeye" Hurst, a bearded toolmaker featured in "The Last Truck: Closing of a GM Plant" from filmmakers Steven Bognar and Julia Reichert. "I don't care about the rules," Hurst joked while chatting with partygoers. "If they win, I'm going up on stage." Former Washington governor and right-to-die advocate Booth Gardner, subject of "The Last Campaign of Governor Booth Gardner" from Daniel Junge and Henry Ansbacher, planted himself at a table near a piano player while disabled Zimbabwean singer-songwriter Prudence Mabhena, subject of "Music by Prudence" from Ross Williams and Elinor Burkett, chatted with guests around the room. Jon Alpret, co-director of the Oscar-nominated short documentary "China's Unnatural Disaster: The Tears of Sichuan Province," cheerfully introduced his mother — his date to Sunday's ceremony — to other partygoers. The longtime documentary filmmaker said he was enthusiastic about his first Oscar nomination but acknowledged he wasn't totally in his element at the ritzy affair. "Anything in Beverly Hills makes me feel weird," he said. BEAM ME UP, OSCAR: It takes a starship crew. The three-person Oscar-nominated makeup team for "Star Trek" were quick to point out that it took dozens of hair and makeup artists to bring the Vulcans, Romulans and other species to life in the reimagined "Trek" during a Saturday afternoon symposium featuring this year's batch of Oscar-nominated hair and makeup artists. "We're thrilled there were 40-plus makeup artists, 12 of which are out here today, who stood beside us," said "Trek" makeup department head Mindy Hall at the Samuel Goldwyn Theater at the Academy of Motion Picture Arts and Sciences. "They weren't behind us. They were beside us, taking the designs and bringing them to life." Clips highlighting the work from the three nominated films were shown, and present nominees took questions from the audience. The "Trek" makeup team, which also includes alien designers Joel Harlow and Barney Burman, revealed they went through seven different designs for the villainous blunt foreheaded Romulan race. "From the get go, we all wanted to do work that was worthy of this," said Burman of their nod. GOING FOR THE GOLD: Argentine director Juan Jose Campanella isn't modest about his passion to win his first Oscar. Campanella, whose crime drama "The Secret in Their Eyes" is nominated in the foreign language category, made no bones about his intense desire to take home a little gold man during a Saturday morning symposium featuring clips and the directors of the five nominated foreign language films. "You put me in any game, and I want to win," Campanella declared. "There's nothing more boring than playing cards with four people who want to lose." "The Secret in Their Eyes" is up against France's "A Prophet," Israel's "Ajami," Peru's "The Milk of Sorrow" and Germany's "The White Ribbon," the black-and-white film which took the top prize at the Cannes Film Festival last year. Campanella was nominated in the same Oscar category in 2002 for "Son of the Bride." The nominations of "The Secret in Their Eyes" and "The Milk of Sorrow," directed by 33-year-old Peruvian filmmaker Claudia Llosa, mark the first time that two films from South American countries have been nominated. AP entertainment writers Sandy Cohen and Derrik J. Lang contributed to this report.